Professional stringing is all about accuracy and consistency. The strings need to be installed in the racket at the desired tension, and that needs to be repeated racket after racket after racket. This allows players to have confidence that when they hit the ball, they will get the result they expect over and over and over. 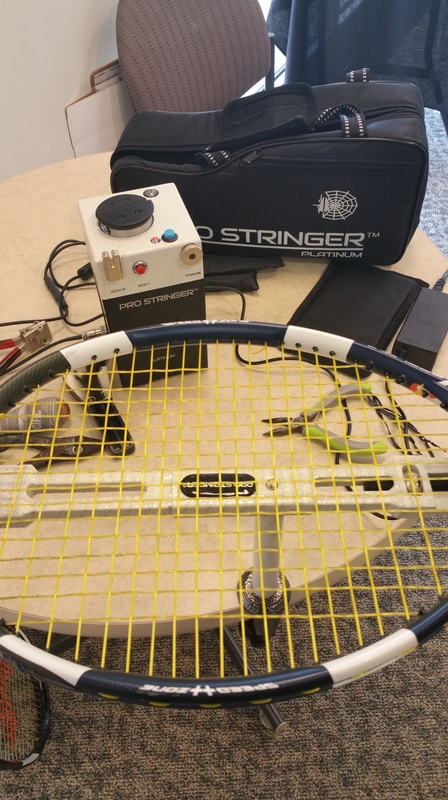 Professional tennis players must contend with different stringers and stringing machines every week, introducing some natural variation into the consistency/accuracy equation. But the differences are magnified because some of the stringers on tour use questionable techniques and some of the machines pull questionable tensions. This is especially true of – though not limited to – the lower levels of professional tennis. It is a sort of insult to injury situation when players are not even earning enough to cover their expenses and are receiving inaccurate and/or inconsistent for their hard earned money. So, even though I get paid as an “on site” stringer at professional tournaments, I completely understand why some players would look for a better, more affordable “off site” option. As I noted in a previous post, Rubin Statham and his brother spent some $17,000 on stringing in their first year on tour, and found the quality of stringing, especially in Asia, abysmal (my term, not his). 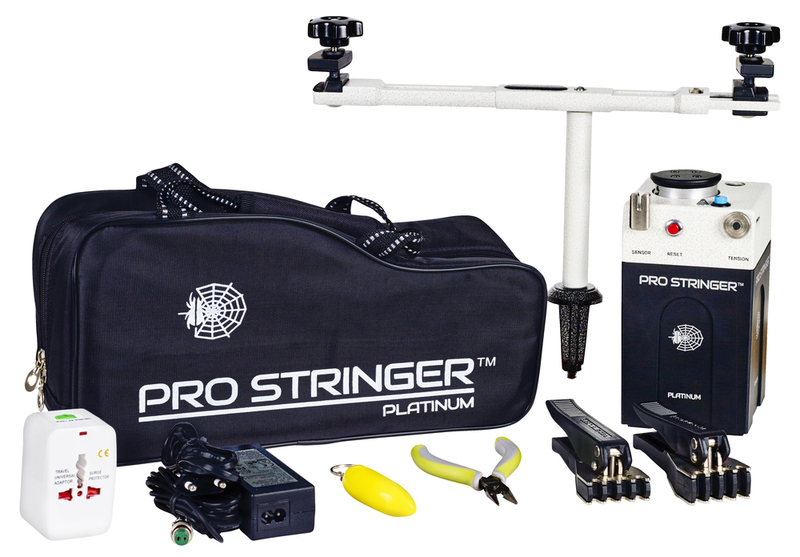 Statham’s need for good quality, consistent, and affordable stringing led him to design and bring to market the Pro Stringer Platinum, a 4 pound, electronic, constant pull stringing machine that fits in a small travel bag. I was fortunate to meet Statham at the ITF Pro Circuit Winston-Salem Futures last month and he was nice enough to allow me to test his machine. 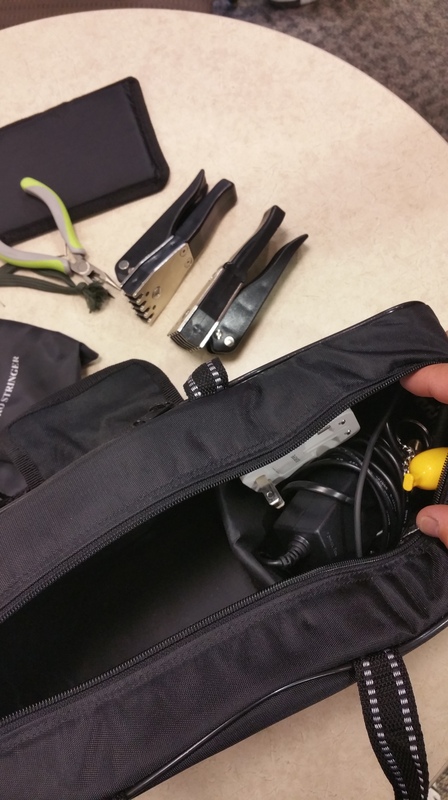 The package consists of a swiveling mount that attaches to a table top, a tensioner, two flying clamps, and a power supply that is convertible to be used anywhere in the world. The Pro Stringer is easy to set up and get the frame mounted on. Because it clamps to a table top, I actually ended up stringing the racket sitting down because it was too low to stand up and use. This took a bit of getting used to, but could also be a benefit for the player stringing their own rackets at the end of a long day. The two point mounting system held the racket securely. For most professional stringers a 6 point mounting system is preferred to reduce stress on the frame, but let’s not forget that the Prince Neos has been used to string millions of rackets over the years with a two point mounting system. 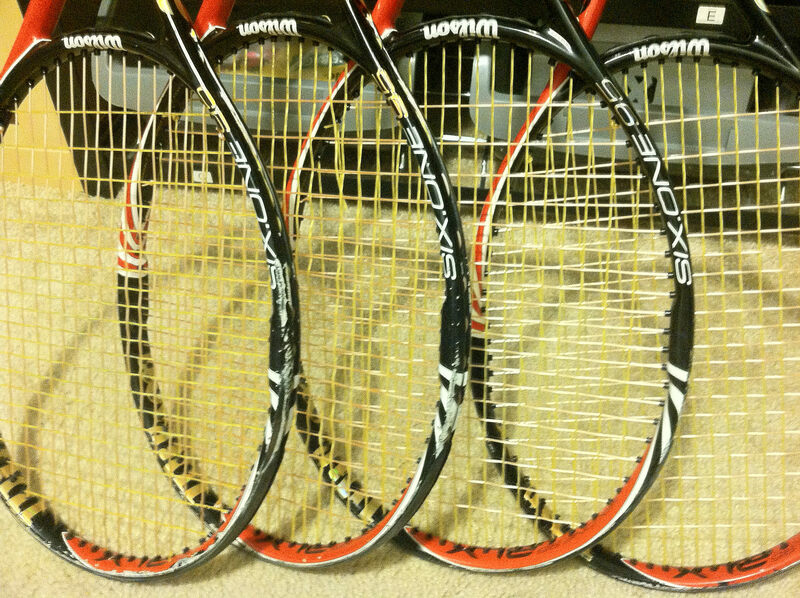 My test racket was one I have strung many times in the past year on both my Babolat Star 5 and Wilson Baiardo machines: A Wilson Pro Staff 97 RF with Pacific X Cite 1.25mm string at 55 pounds. I have a good idea what the stringbed should feel like after installation: 39 units of dynamic tension measured using an ERT 300 tennis computer. I first used my scale to test the calibration of the Pro Stringer’s tensioner. I found that it initially pulled to the 55 pounds reference tension, but then quickly feel back to 50 pounds. That is not optimal, but if it consistently pulls to 50 pounds when set at 55 pounds reference tension (which it seems to do), then I could easily adjust for that. A unique aspect of the Pro Stringer is that you move the tensioning unit itself, setting it up against the frame and then running the string into the rotary tension head and pressing the tension button. Because the tensioning unit has to be as tall as the racket, the Pro Stinger has only 180 degree not 360 rotation (like the Prince Neos and unlike the Star 5 and Baiardo). So, I had to get used to swinging the racket back and forth to string. Statham also showed me how to make the process faster by not only swinging the racket but also tilting and moving the tensioning unit at the same time. With some practice, I think that would really speed up the process. Using my own starting clamp in addition to the supplied flying clamps I was able to install the mains in just under 9 minutes. I never use flying clamps so this was a bit cumbersome for me but I got better with them as I went. Stringing the crosses also took longer than normal (about 15 minutes) because of the need to set the tensioning unit against the frame and also because the cross-beam on which the frame mounts sit is so close to the string bed. There is less than an inch of clearance so you have to weave to the middle of the frame and then make an awkward (for me) transition through the middle mains and then you can continue onto the other side of the frame. I took a couple of additional minutes to tie off the crosses and use my setting awl to straighten the strings, both of which were harder because the frame mount is naturally not as sturdy as on a 150 pound machine. In the end, the dynamic tension of the stringbed as measured by the ERT 300 was 31. Although the conversion from DT to pounds of tension is not perfect, the DT of 31 suggests that the stringbed came out about 10 pounds looser on the Pro Stringer than on the Star 5 or Baiardo. As already noted, about 5 pounds of this was due to the tensioner’s calibration being off. The other 5 pounds was likely due to the quality of and my clumsiness with the flying clamps. Overall, I liked the Pro Stringer a lot. 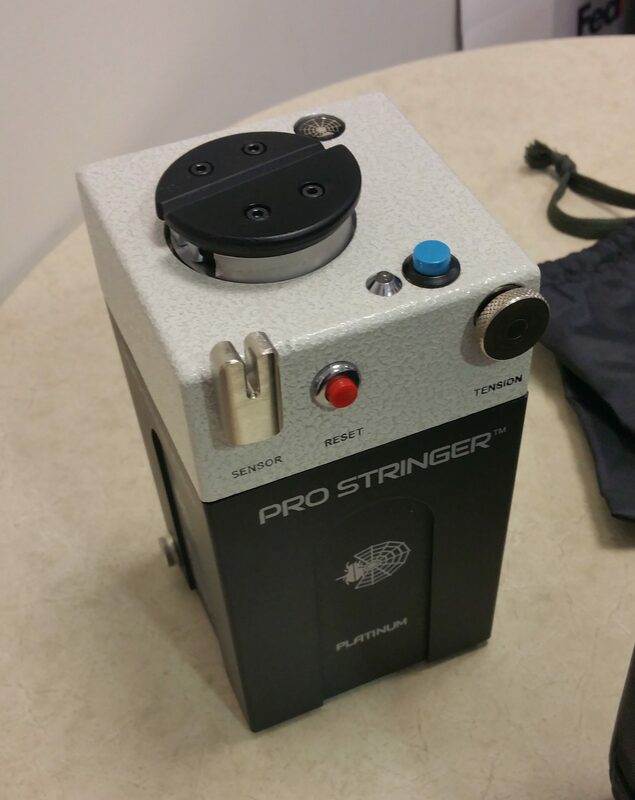 It does what it does – provides players with a portable electronic, constant pull stringing machine — as well as any machine I know. At a cost of US$790, it will easily pay for itself in a year’s time or less for a serious professional who restrings as often as they should. If I played tennis for money and had to travel a lot I would definitely get one. It’s also a good option for traveling junior tennis players as well as underfunded college teams. 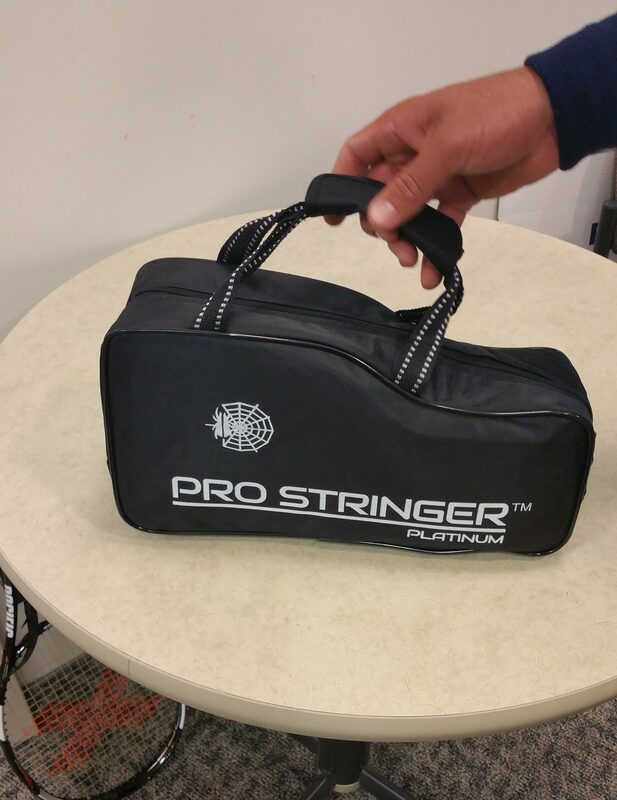 That said, there are a number of improvements I would like to see to the Pro Stringer. Setting the tension on the machine uses an analog dial (like the Neos) rather than a digital display (like the Star 5/Baiardo). That was tough to use with my old, bad eyesight. Better clamps would be great – something like the well-regarded Stringway flying clamp. More room between the cross brace and the frame would be very helpful with weaving the crosses. There is no table lock, so I don’t know how hard it would be to string a Prince O Port racket. I guess you would use the banana/boomerang tool, but I have never had to do that with my other machines’ table locks. Non-essential but convenient options on the tensioning unit would be a pre-stretch option and a knot over-tension option. We use those frequently during ATP Tour events. I don’t know the status of the project, but in discussing these issues with Statham he indicated that a new version of the Pro Stringer is in production which will incorporate many of these changes. I look forward to giving the new model a try when it is available. I have been fortunate enough to string a variety of different tournaments, from the ATP 500 Citi Open in Washington, DC to the USTA 12s National Clay Courts in Winston-Salem to USTA Adult League tournaments, and various points in between. One commonality across all levels of play is the badly strung tennis rackets I see coming into the stringing rooms. I have seen a Top 50 players come to Washington from South America with distorted frames. A player at the ATP 250 Winston-Salem Open complaining about the inconsistent stringing they got at other 250s in Europe. 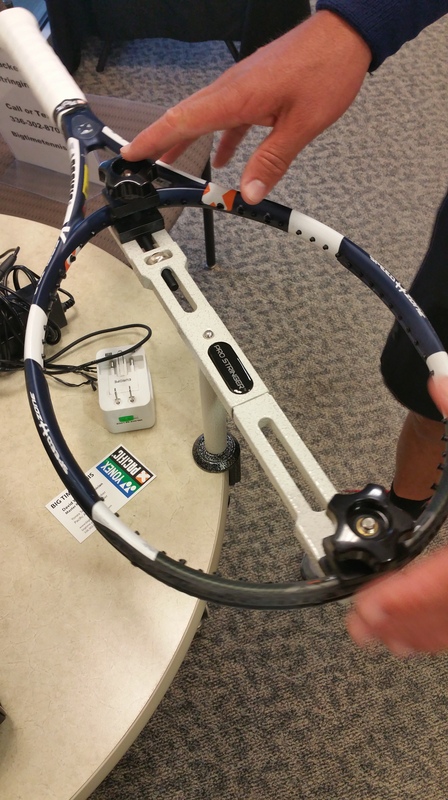 One year a Wake Forest player had his rackets strung at the Edwardsville Futures with the monofilament mains and synthetic gut crosses reversed. I see junior players’ rackets with misweaves, and rackets with “free” stringing from Tennis Warehouse (which allegedly employs USRSA Master Racquet Technicians) with loose knots and crooked strings (sometimes you get what you pay for). 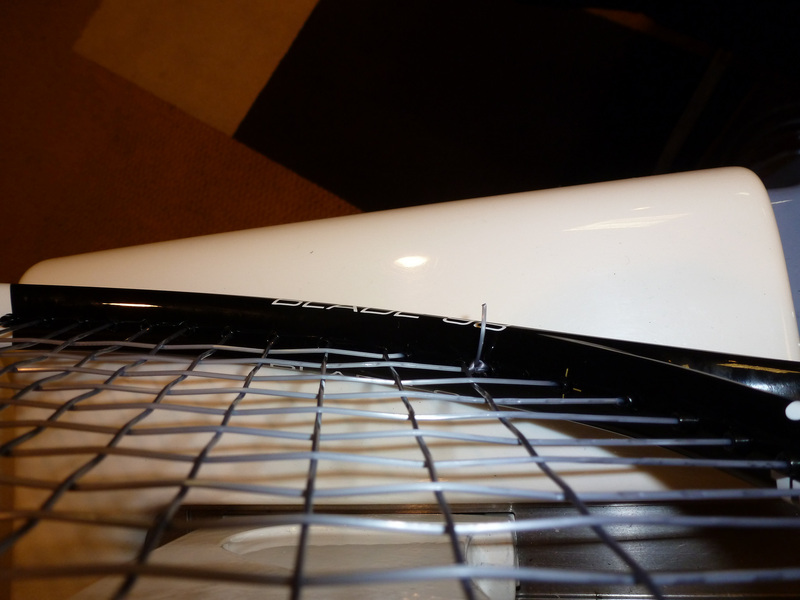 Bad stringing is so common that I started a “stringing and racket fails” album on my Flickr site. Having written about the difficult economics of the entry level of professional tennis, I find it particularly offensive to hear about guys playing ITF Pro Circuit Futures events and paying $20 a racket for substandard stringing. Rubin Statham experienced this first hand. In his first year on tour he and his brother spent some $17,000 on stringing and found the quality of stringing, especially in Asia, abysmal (my term, not his). To say that necessity is the mother of invention is a cliché, but like all clichés there is an element of truth in it. Statham’s need for good quality, consistent, and affordable stringing led him to design and bring to market what he claims is the world’s smallest and lightest stringing machine: the Pro Stringer Platinum. At 4 pounds and fitting in a small bag, I have no reason to doubt him. I met Statham this week at the ITF Pro Circuit Winston-Salem Futures and he let me give his Pro Stringer a try. In my next post, I will give my review of it.